Upbeat Bird is a fiendishly difficult jumping game in which you can only jump highest on the upbeats relative to a bass line. The closer you are to the upbeat, the higher you jump! An upbeat is the opposite of a downbeat. Tap your foot to the music playing. Now clap opposite your foot tapping. You’re clapping upbeats. Simple, right? Now you’re ready to play Upbeat Bird and learn to hit upbeats effortlessly! 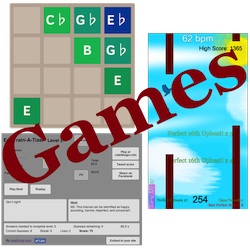 Manipulate Time – Develop Musical Superpowers!